← How Does the New Heaven 17 BSOG Compare To My Attempt? Almost as soon as I began filling what would, in time, be referred to as the Record Cell, I have been aware of Conny Plank and his contribution to the music that I love. He was the “doctor” that delivered countless seminal recordings that have informed my world. His sonic and musical creativity first pegged my radar when I bought one of the first albums that I did after finally getting a stereo in 1979. Having been obsessed with “Autobahn” [in its brutal 3:30 US edit!] as a child, I could hardly wait to hear that song again. I bought the album and noticed that Plank had engineered the recording, which had been recorded in lnstudio. Duly noted and filed for future reference. By the next year, I would see his studio on the inner sleeve of DEVO’s debut album. In 1980 he was the producer of Ultravox’s “Vienna” and that was another major inflection point for me. Then I saw his name on records by Killing Joke, Eurythmics, DAF, Eno, Cluster, Neu!, Les Rita Mitsouko and many more; encompassing both experimental rock and pop alike, with plenty of room for experimental pop. My favorite musical flavor of all. Plank died in 1987 when cancer took its toll on the producer at the early age of 47. His son Stephan has now spent what seems like a decade making this film as both a tribute to the artistic legacy of his father, and also an examination of his absence during the time in his life when his father held court in the outskirts of Köln, Germany. Where the adventurous would journey to the famed Conny’s Studio for some of that Plank magic on their recordings. Of course the elephant in the room would have to be Ralf Hütter of Kraftwerk! 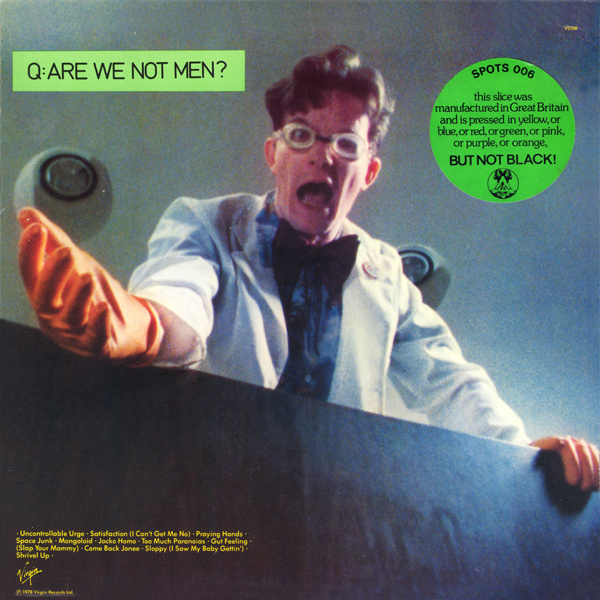 Plank recorded not only the first four Kraftwerk albums, but also was present for the primordial origins of the band from 1969 as the band Organisation, whose “Tone Float” album will cost you three to four hefty figures if you simply must have the one “official” legit pressing from the UK. Given that Hütter is beyond reticent to even acknowledge the pre-“Autobahn” era of the band, it was exciting to see that Michael Rother of Neu! interview by the younger Plank. true, Rother never recorded with Kraftwerk in the studio, but when he and Klaus Dinger split from the Kraftwerk mütterschiff that was as profound an impact for their absence in Kraftwerk as it was from their presence in the equally groundbreaking Neu! Of course, many of the artists who Plank touched appeared in this film. Annette Humpe, Midge Ure, Jaz Coleman, Gerry Casale, and Hans Joachim-Rodelius were all present. Given the gestation of this film, it was fortunate that the filmmakers were able to have representation by now deceased musicians such as Fred Chichin of Les Rita Mitsouko and Holger Czukay. Czukay in particular took pains to tell the younger Plank how his father found him in the way of his work as a child. Then the scene of Annete Humpe asking how much time his father spent with him as a child also cut to the quick. One of the pleasures of the documentary is not of seeing more of what I knew about Plank, but in learning new things even at my old age. When Karl Hyde of Underworld appeared, I had to ask my wife, “what’s he doing here?” As it turned out, the band had decamped from Wales to Conny’s Studio in order to record their debut single, “Doot Doot.” They recorded a version of that song with him that i have never heard, since their label released the demo version instead. Knock me over with a feather. Here’s more of Hyde’s interview with scenes that are not in the final film. Another revelation was provided by the early electro hip hop band Whodini. I knew that they had worked with Thomas Dolby on their debut album. I’m familiar with “Magic’s Wand,” but I had no idea that Plank also produced two tracks on that album. 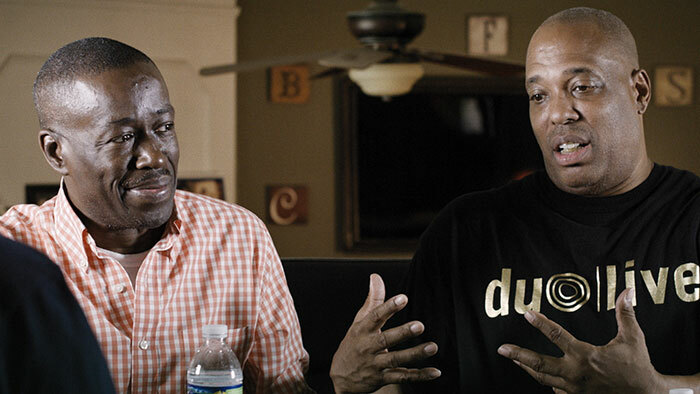 Jalil Hutchins and Drew Carter waxed eloquent about how they were sent to Germany at the behest of Clive Davis [I guess he’s not all bad…] to record with Plank for a sound that would electrify. They remembered Stefan as a young boy and had fun playing with him even as they were cowed by all of the gold and platinum records adorning the walls of the guest bathroom at the compound. The film also related the memorable tale of how Daniel Miller could afford three days of DAF in Germany for Plank to record their second, more musical album. Miller recounted how days one and two were spent simply talking as the youthful label owner was quietly panicking. Of course, on day three, they got it all down on tape! That pointed to Plank paying attention to all aspects of a recording session. It was so much more than just mike placement and FX boxes, but for the most part, the film eschews too many dives into the tech bucket to look at the gestalt that Conny brought to his work. The last scenes of the film showed Plank bringing his family to the farm [now luxury condos, of course!] where he spent his youth with a parade of rock musicians coming in one door and out of the other. One got the feeling that he had decided not to fully emulate his father and stay immersed in work to the detriment of his family relationships. Much was spoken about how Plank’s partner Christa Fast was the person who kept the entire operation moving along, but as she had died in 2006, she was sadly absent from this film in a contemporary sense. Fans of the PPM sound, as we can call it, would find a lot to enjoy in this film. Cleopatra Entertainment are distributing the film in America and the DVD is out there, though it’s got only a slideshow as any extras. With that in mind, here’s a festival Q+A between the director, Stephan Plank, and moderator Paul Williams [not the gnomish songwriter]. 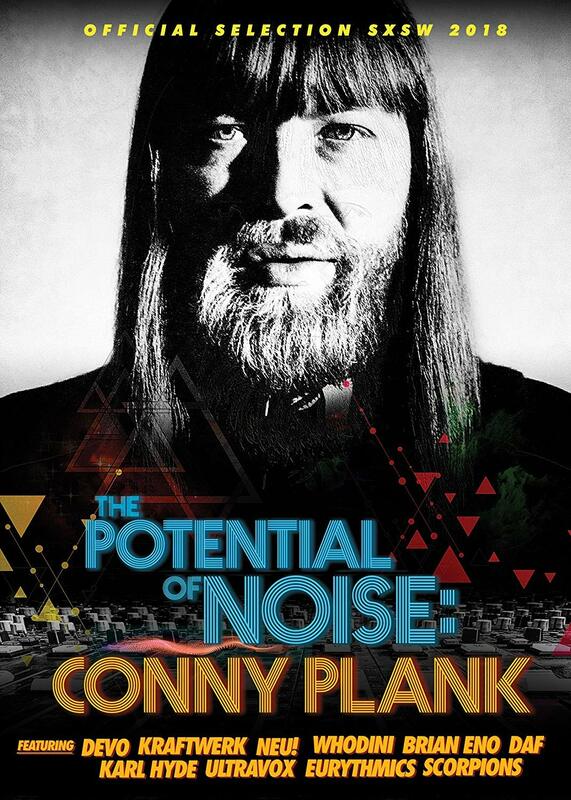 This entry was posted in Uncategorized and tagged 2018, Conny Plank, Documentary. Bookmark the permalink. Thanks for the tip! And I can’t believe I heard a snippet of Ideal’s Monotony in the trailer! Jeremy Shatan – I still have Ideal on my want list, and I have not played the trailer and honestly? I have Humpe Humpe records but not that one. I would probably not recognize Ideal if I heard them. My dad went to a conference in Köln around 1980 and brought back Ideal and Trio records for me and my sister and I became a fan of both. I asked him how he picked them and he said it was because all the Germans at the conference were either irritated or angry about them, which meant they were probably good! I later found more Ideal albums and 12″ at St. Mark’s Sounds for very little money. I don’t think they got much respect on either side of the ocean back then. Now? Forgotten! Maybe I’ll propose them for a future Off Your Radar issue (www.offyourradar.com). Cheers! Jeremy Shatan – What a great story! Your dad was a smart guy! I was cognizant of Humpe Humpe from 1985 but only became aware of Ideal from comments made on the blog a few years back from commenter stellaVista. That’s when they went in the want list. Thanks for the heads up Monk. I have so much music that Conny has been involved in either as producer, engineer or musician. So many bands for me produced such great work with Conny. It’s such a shame that he died so young. He certainly deserves to be celebrated. I will definitely watch this film with great interest. Conny produced what is still my all time favourite album by Ultravox. Rage in Eden. Will check out this film. thanks monk for all the information. involved, and all the diversity with them. reposted the karl hyde clip on the underworld forums. Fred – Good point! Not forgetting Rushent’s involvement with getting Visage off of the ground, and Altered Images. What Joy Division did he produce? That’s new to me. on the Heart and Soul Joy Division 4-CD compilation there are four songs from an unreleased Genetic Records session at Eden Studios. Not much but it still counts, lol…. Fred – Wow. I had that box briefly and can’t remember much about it now other than it was way more Joy Division than I needed.